The world’s first adhesive postage stamp is probably also the most recognised anywhere in the world. Featuring a profile of queen Victoria in 1840 when she was just 20, this image remained the same until her death aged 81. Edges often appear lopsided as they were printed in a sheet and cut up by hand and the red franking mark proved easy to rub off so was soon replaced. 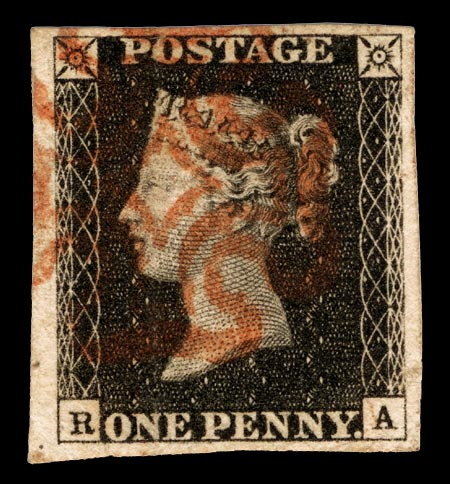 Ultimately, almost 70 million Penny Blacks were printed but their considerable age means only limited number survive. To answer the obvious question, mint ones go for upwards of £3,000 but you can usually add a used one to your collection for about £100. And, yes, you can usually source one at Charing Cross Collectors Market every Saturday. Rod on Be a Dealer for the Day!